We’d love your help. 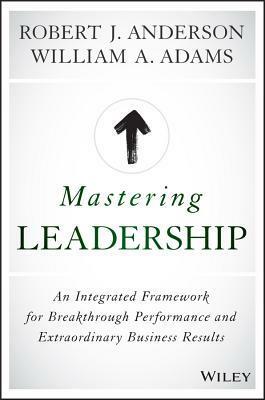 Let us know what’s wrong with this preview of Mastering Leadership by Bob Anderson. For most leaders today, complexity is outpacing their personal and collective development. Most leaders are "in over their heads," whether they know it or not. The most successful organizations over time are the best led. Is your leadership a competitive advantage, or is it costing you? How do you know? Are you developing your leadership effectiveness at the pace of change? To ask other readers questions about Mastering Leadership, please sign up. 1) Mastering Leadership builds on a solid and valid foundation of human development theory, which I learned in graduate school many years ago, use regularly in my work, but never thought to apply specifically to the area of leadership development. 2) The authors acknowledge and use an understanding of what they call the Inner Game (Inner Operating System) and the Outer Game (complex combination of values, beliefs, experiences, assumptions, and so on). 3) The authors use the core concept of Identity in this fairly complex, but clearly explained model which incorporates both Creative and Reactive styles of leadership behavior, while also including the familiar dichotomy of Task orientation versus Relationship orientation. The ideal leader is proficient at both Task and Relationship, while increasing their creative behaviors and reducing their reactive behaviors. The ideal leader seeks and achieves growth through five leadership stages (Egocentric, Reactive, Creative, Integral, and Unitive). Without going into detail here, this book is not just about becoming a more effective leader, but becoming a more effective force in our world. The Leadership Circle: A graphic representation of Creative and Reactive styles, along with Task and Relationship. The Leadership Circle Profile: This tool gives us a visual assessment of our Creative and our Reactive behaviors, along with how we "tilt" toward Task or Relationship. Using these two tools, our future goals are more easily identified as we plan to increase Creative, reduce Reactive, and balance Task and Relationship. The book covers a fairly complex and deep theoretical model, but does so articulately and with plenty of examples from real life. It is wonky enough to satisfy the statistical nerds among us, but available enough for those who just want to learn and grow. When you finish digesting the various charts, graphs, and images, you move into deep reflection about yourself and the role of leadership in your life. Many familiar names and terms pop up in both the text and the index, which is one of the things I look for in a book that purports to be useful to me. Filled with solid research-based knowledge, it covers a broader scope than most other leadership development books I have read. Mastering Leadership is not "easy" reading, but it IS very engaging reading for anyone serious about expanding their knowledge of how we can help ourselves and others. It does not offer simple solutions or reheated and empty slogans, but a model and a tool to help us become much more intentional about developing our leadership abilities effectively. As with most of books of this type, the authors are selling a product, and they claim that theirs is better than the others - they used the word "breakthrough" more than few times along with "groundbreaking". That always trips my radar. But, they do cite many other leadership authors, but usually with a caveat that the author/theorist was missing something (that they figured out). I'm in a yearlong management seminar program and we are assigned executive summaries of various books. If possible, I As with most of books of this type, the authors are selling a product, and they claim that theirs is better than the others - they used the word "breakthrough" more than few times along with "groundbreaking". That always trips my radar. But, they do cite many other leadership authors, but usually with a caveat that the author/theorist was missing something (that they figured out). I'm in a yearlong management seminar program and we are assigned executive summaries of various books. If possible, I like to try to read the source text before the class. In this case, the text is quite large and the editor distills it to 8 pages. They didn't do too bad a job, but pretty much all of the theory and supporting case studies had to be omitted. I was quite surprised to see them give redundancy a completely new definition. They didn't know they were, because they said they were borrowing it from engineering: "Redundancy results when one tension resolution in the structure depends on a second tension resolution in the structure and vice versa." Uh...redundancy means duplicate systems to minimize single points of failure. The first 6-7 chapters could be condensed and less about selling his model. The last few chapters were most powerful and useful. I still had some very powerful takeaways so I am glad I stuck with it. Mastering Leadership: An Integrated Framework for Breakthrough Performance and Extraordinary Business Results by Robert Anderson and William Adams was chosen by Soundview Executive Book Summaries as one of the Top Business Books of 2016. For most leaders today, complexity is outpacing their personal and collective development. Most leaders are in over their heads, whether they know it or not. The most successful organizations over time are the best led. While this has alway Mastering Leadership: An Integrated Framework for Breakthrough Performance and Extraordinary Business Results by Robert Anderson and William Adams was chosen by Soundview Executive Book Summaries as one of the Top Business Books of 2016. For most leaders today, complexity is outpacing their personal and collective development. Most leaders are in over their heads, whether they know it or not. The most successful organizations over time are the best led. While this has always been true, today escalating global complexity puts leadership effectiveness at a premium. Mastering Leadership involves developing the effectiveness of leaders — individually and collectively — and turning that leadership into a competitive advantage. This comprehensive roadmap for optimal leadership features the first fully integrated Universal Model of Leadership — one that integrates the best theory and research in the fields of Leadership and Organizational Development over the last half century, the five stages in the evolution of leadership — Egocentric, Reactive, Creative, Integral and Unitive — along with the organizational structures and cultures that develop at each of these stages, six leadership practices for evolving your leadership capability at a faster pace and more. Mastering Leadership provides a systemic approach for developing your senior leaders and the leadership system of your organization. By more meaningfully deploying all of who you are every day, individually and collectively, you will achieve a leadership legacy consistent with your highest aspirations. I have been reading this book for a leadership class and have enjoyed it a lot. At it's heart, the book is a universal model of leadership based on stages of development of the ego. It's really enjoyable to read -- and even more useful if you take the online test, and even more useful if you have colleagues and coworkers who can also evaluate you. The book draws on many influences -- lots of metaphysical stuff at the end -- and is very well organized with some good portraits of individual leader I have been reading this book for a leadership class and have enjoyed it a lot. At it's heart, the book is a universal model of leadership based on stages of development of the ego. It's really enjoyable to read -- and even more useful if you take the online test, and even more useful if you have colleagues and coworkers who can also evaluate you. If you are looking for a leadership development approach for your organization, this books lays out a fairly comprehensive model. I took away a number of key insights that I will be using in my own development as mindful leader and in my practice in developing other leaders. Great book. When we ask people to identify the extraordinary leaders they have worked for or with, most cannot identify more than one or two, suggesting we hold leaders, and are held as leaders to very high standards. Given these violated expectations, we might wonder why anyone would want this job. Leaders carry enormous responsibility and operate in a world of increasing change, complexity, and connectivity. They are asked to work with more transparency and disclosure as they endure greater scrutiny. Despi When we ask people to identify the extraordinary leaders they have worked for or with, most cannot identify more than one or two, suggesting we hold leaders, and are held as leaders to very high standards. Given these violated expectations, we might wonder why anyone would want this job. Leaders carry enormous responsibility and operate in a world of increasing change, complexity, and connectivity. They are asked to work with more transparency and disclosure as they endure greater scrutiny. Despite these challenges, many leaders love their jobs and see what they do as a calling. They relish the chance to influence people, create positive results, and change things. in which individuals and organizations thrive. Leaders spend most of their days in conversation—meetings, phone calls, emails, and strategic communications. How you show up in these conversations determines your level of effectiveness. How we show up together in these conversations drives our collective effectiveness. The quality of our collective conversation largely determines our collective leadership effectiveness and business performance. the more we are defined by other people's approval, the more likely we will fear rejection and be risk-averse, indecisive, cowardly, and compliant. The more we define ourselves by our results, the more likely we fear failure and fail to delegate, collaborate, build teamwork and allow others to engage meaningfully and creatively. We will tend to relate to others in autocratic and controlling ways. If we define ourselves on our intellectual capacity, we will fear vulnerability, fail to connect with others, acknowledge their brillance, and relate to others in a self-protecting, arrogant, analytically critical and condesending way. Reactive beliefs are self-limiting and have serious liabilities. The more we are run by them, the less we lead effectively, and since leadership effectiveness drive business performance, reactive leadership leadership puts us at a competitive disadvantage. Leadership is a conversation. How we show up to that conversation is what matters most. What we do as leaders drives our organization's collective effectiveness. This book is not just another leadership book like all the others on your book shelf. In Mastering Leadership we get a true guide to, not only mastering your own leadership development, but that of all those in your organization you serve. Through this book's teachings you will learn to have the courageous conversations, both with yours Leadership is a conversation. How we show up to that conversation is what matters most. What we do as leaders drives our organization's collective effectiveness. This book is not just another leadership book like all the others on your book shelf. In Mastering Leadership we get a true guide to, not only mastering your own leadership development, but that of all those in your organization you serve. Through this book's teachings you will learn to have the courageous conversations, both with yourself and your team. No matter where we sit within our organizations, we are all leaders. Mastering Leadership guides us on the path to being the best leader we can be on the road to integral leadership and the transformation to greatness. Some great leadership theory here! But having used the Leadership Circle Assessment at work, which is what he is trying to sell, i found the concepts were too complex because there were too many moving parts for leadership to buy in to it. It certainly started the conversation, but did not lead to change in leadership styles. This book will likely change my understanding and approach to my own leadership development and that of those I'm privileged to walk with on the heroic leadership journey. What an amazing book! Not an easy read. And I'm so glad to have read it. Leadership as personal growth and development AND Leadership as spiritual practice! Wow! Brilliant, theoretical and practical. Best book on Leadership I've ever read. Impressive research validating their phenomenal model. Extremely well explained. Lucid, liberating and inspiring. Will be re-reading this one. Best book on leadership of this decade! Robert J. Anderson is the Founder and Chairman of The Leadership Circle and the Full Circle Group. Over the past 35 years, Bob has dedicated his career to exploring the intersections between leadership and mastery, competence and consciousness, spirituality and business. Bob is the creator of The Leadership Circle Profile, an integrated and innovative leadership assessment tool. A culmination of y Robert J. Anderson is the Founder and Chairman of The Leadership Circle and the Full Circle Group. Over the past 35 years, Bob has dedicated his career to exploring the intersections between leadership and mastery, competence and consciousness, spirituality and business. Bob is the creator of The Leadership Circle Profile, an integrated and innovative leadership assessment tool. A culmination of years of research, The Leadership Circle Profile and its associated assessment tools are used by thousands of organizations around the world. The Leadership Circle and Full Circle Group earned first place in the Large Leadership Partner and Provider category of the HR.com 2015 Leadership 500 Excellence Awards. Bob is a true pioneer in the field of leadership development and research. Throughout his career, Bob has worked with CEOs and leadership teams to help them improve their leadership effectiveness. He has also partnered with independent consultants and coaches around the world to help them master the skills of coaching and developing executives to achieve greater personal and organizational effectiveness. He now spends the majority of his time creating thought leadership works for consultants and practitioners to use with the mission of impacting global leadership through those dedicated to the craft. Bob's practical wisdom, humility, creativity, humor, and expertise provide a rare and transformative experience for the leaders, coaches, and consultants with whom he works. Bob holds a Bachelor's Degree in Economics from John Carroll University and a Master's Degree in Organizational Development from Bowling Green State University. He serves as adjunct faculty for the Executive Education Center at the University of Notre Dame Mendoza College of Business. There he assists diverse groups of leaders in navigating their own leadership transformations. In 2005, Bob received the Partner in Innovation faculty award. In 2015, Bob co-authored Mastering Leadership: An Integrated Framework for Breakthrough Performance and Extraordinary Business Results (Wiley) with William A. Adams.